Notes: I started this sucker back in March 2007. 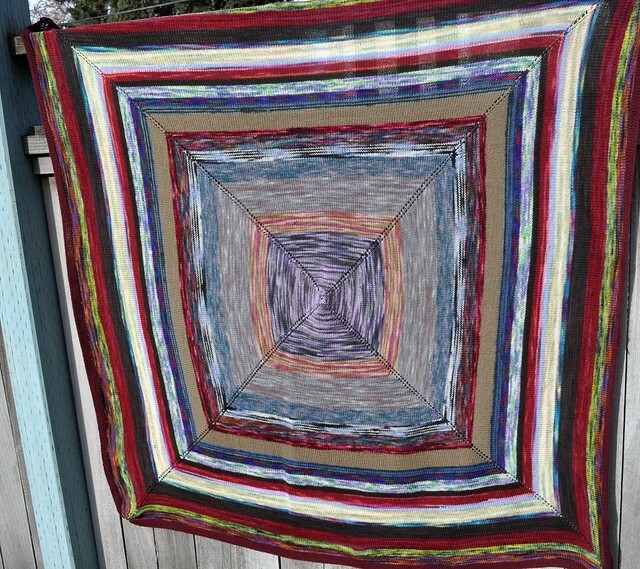 I took the square pattern from the Barn Raising Quilt and just kept going with it. I kept changing needles until I was on a 60" Addi Turbo. By the end it was extremely packed on the needle and I really had to fight with it to keep the stitches moving. The yarns are all leftovers from projects, mainly socks and a few shawls. I just randomly added them as I went. The overall effect is really busy and pretty clunky but it has a certain charm. I only wish I had not used that solid mushroom color. It really brings the whole color flow to a screeching halt. For the edging I knit ten ridges of garter stitch. I should have done much more but I was feeling lazy, as always. I then did a two-stitch i-cord bind off. I should have gone up at least one or two needle sizes for this as it wants to pull in quite a bit. I then blocked the hell out of it. The fabric is very light and drapey and the final size is about 52" square relaxed.